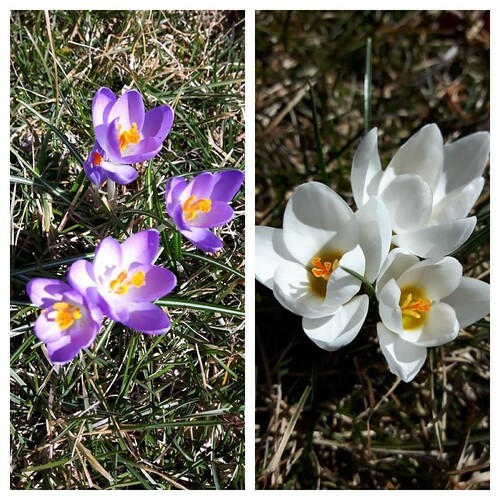 Linda posted these with this comment, "Yay, crocuses in the front yard. Spring, spring, spring!!!!!!!" 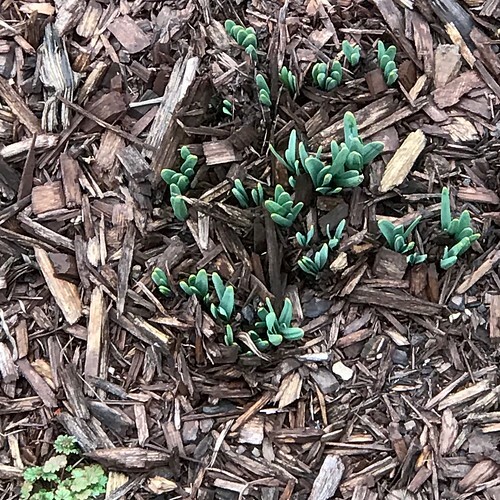 Flowers in my yard are not as far along as Linda's crocuses but they are making their appearance! 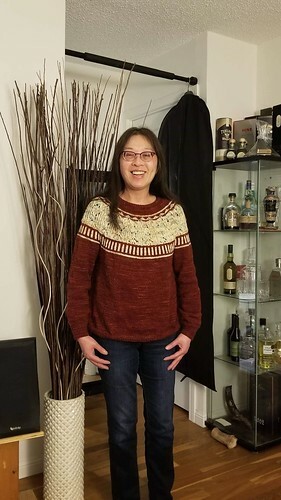 Ceilidh by Julia Farwell-Clay is a lovely pullover knit in the round from the bottom up, with short rows to shape the back hem. 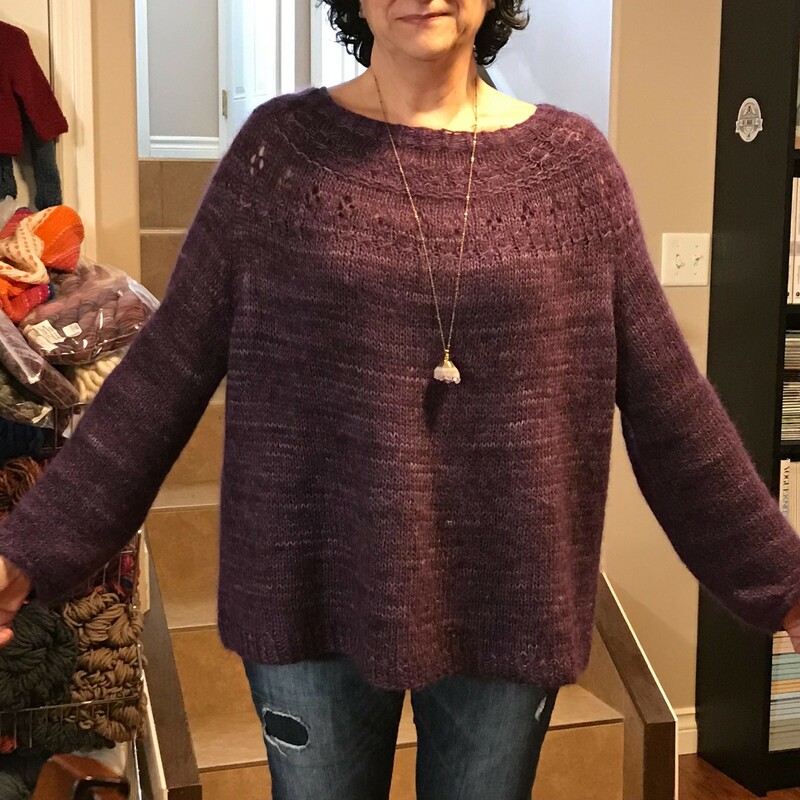 It has pockets where the linings are worked and joined, then the sweater is divided for back and fronts to be worked separately before joining at the shoulder. Sleeves are picked up and worked down flat. Neckband is picked up and knit. 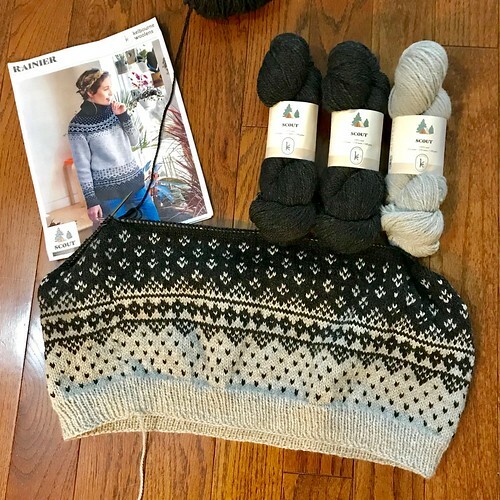 The sweater calls for 1120 - 1820 yards (1024 - 1664 m) of worsted weight yarn, 3.75 mm (US 5) and 4.0 mm (US 6) needles or the needles to get a gauge of 18 stitches and 28 rows = 4 inches in stocking stitch on 4mm needles after blocking. The sweater is worked both in the round and flat so take the time to ensure your gauge is consistent between the two methods. 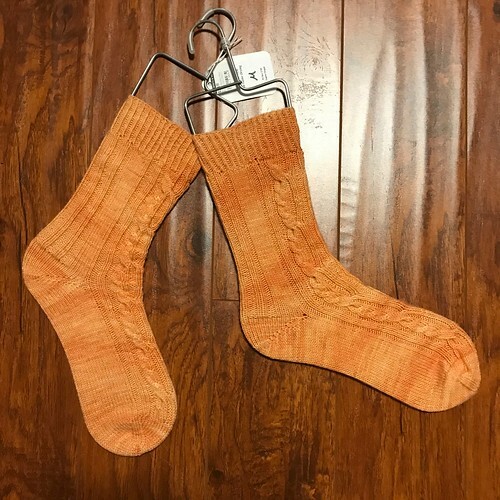 Pintbarb’s Ceilidh was knit using Malabrigo Dos Tierras. The pattern can be found in Pom Pom Quarterly, Issue 21: Summer 2017. 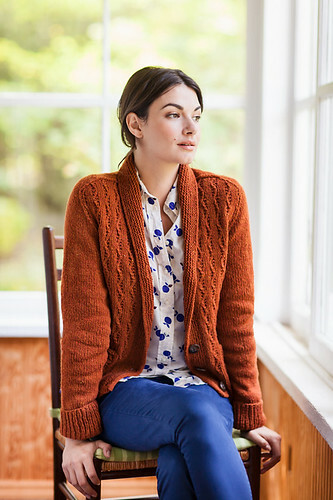 Tinder by Jared Flood is a long A-line cardigan with has knuckle-length sleeves, a deep-ribbed hem, a stand-up collar, and a classic waffle stitch pattern. 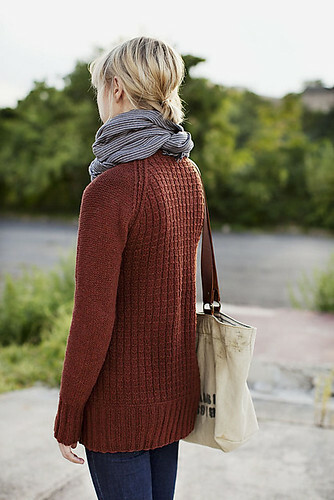 The raglan yoke gives the sweater a casual fit and a cozy feel, perfect for layered walks. 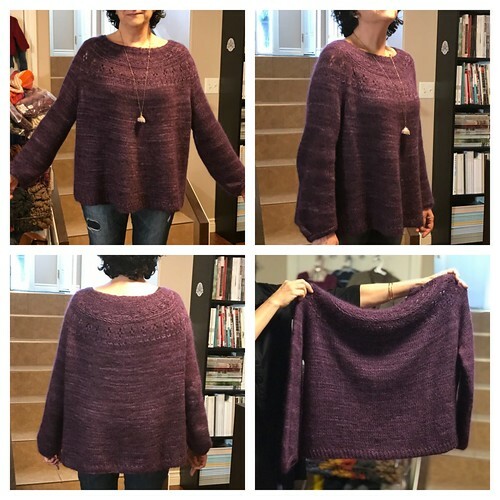 This cardigan requires 1010 - 1595 yards (924 - 1458 m) of worsted weight yarn, 4.0 mm (US 6) and 5.0 mm (US 8) needles or the needles to get a gauge. Gauge is 18 stitches & 28 rows = 4” in Reverse Stockinette Stitch or Waffle Stitch with Gauge Needle; relaxed after blocking. 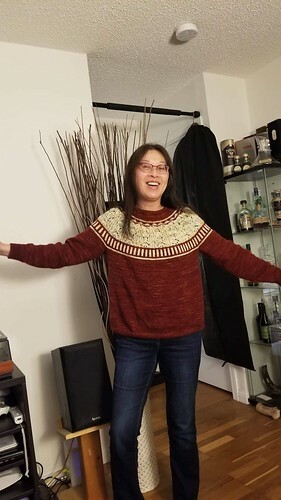 My sister Mary knit herself Tinder! 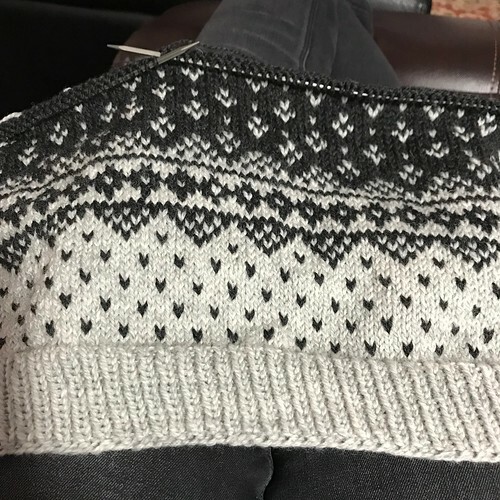 Jared Flood's patterns tend to be knit flat and seamed but it hasn't stopped her from knitting this a Gudrun Johnston's Little Wave. The Little Wave cardigan initially came about as a request from my almost teenage son. He was long overdue a piece of knitwear from his mother! He’s a stylish and classy dresser so I wanted to create a piece that could work with his wardrobe and yet also be something cozy to curl up in. 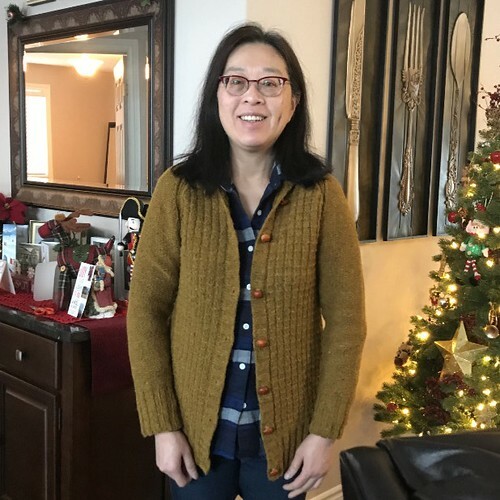 This cardigan has some great classic elements including saddle shoulder shaping, shawl collar and a clearly defined stitch pattern. Faux elbow patches and pockets add a little extra something but can just as easily be omitted. Little Wave is knit using 1090 - 2050 yards (997 - 1875 m) of worsted weight yarn and 4.5 mm (US 7) and 5.0 mm (US 8) needles or as needed to get a gauge of 20 stitches and 28 rows = 4 inches in Little Wave Pattern with the larger needles, after blocking. My Rainier has moved past the body chart colourwork!! Lots of stockinette to go since my plan is to knit it as a dress! 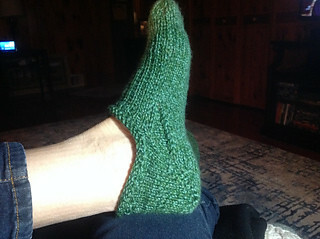 The pattern uses a tubular cast on but I stuck to my twisted German / Chinese Waitress cast on. Instead of going down a needle size like I usually do to make up for my loose gauge, I am using the recommended needles with my new Kollage Interchangeable square needles for the ribbing! I did go down from a 4.0 mm to a 3.75 mm needle. 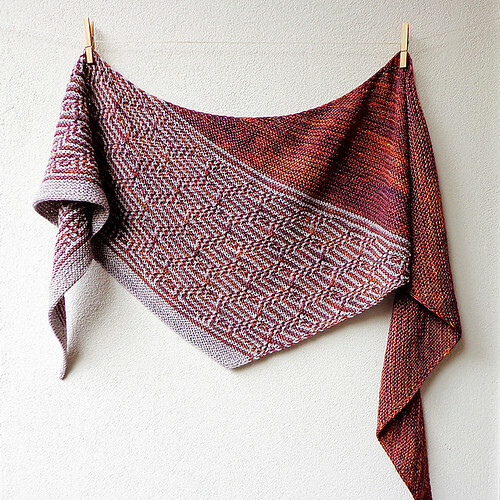 Kollage recommends knitting with a needle size one size larger; I usually knit using one size smaller! 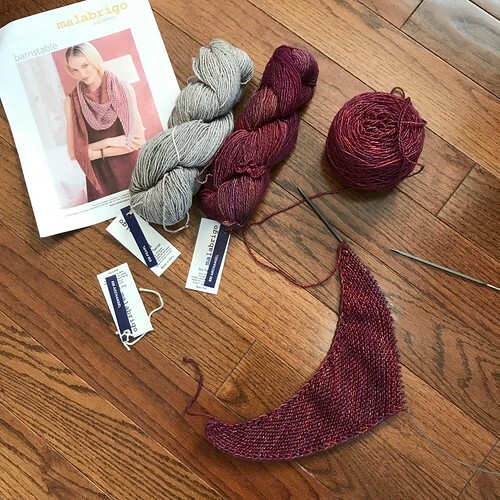 Last night, I cast on Barnstable by Lisa Hannes with Malabrigo Dos Tierras! I am using Archangel and Pearl for my first foray into two colour mosaic knitting. 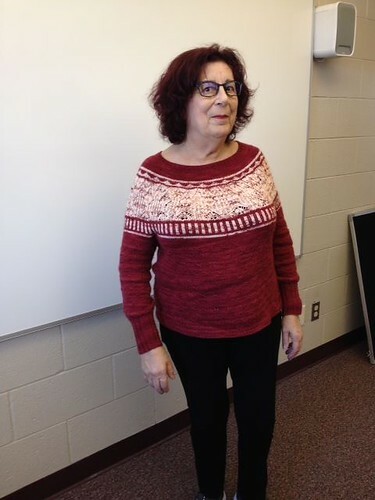 Kathy knit herself RJ Reidel’s Think Spring! 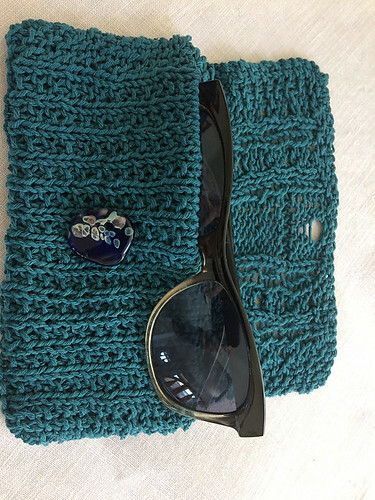 Sunglass Case with her sample ball of Berroco Mantra in her Yarn Tasting bag! 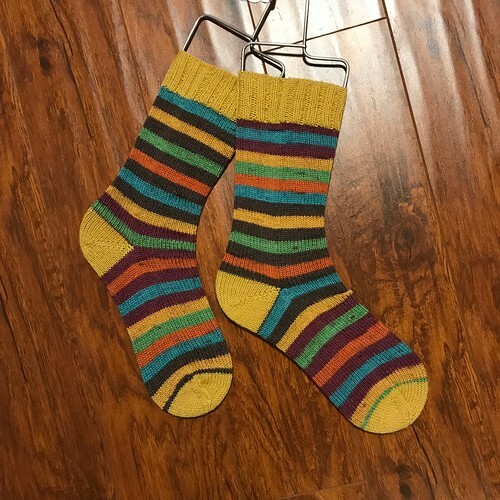 Nik also finished her Spring Showers socks from The Knitting Expat’s The Seasons Sock Club - knit using Zen Yarn Garden Serenity 20. My sister, Mary’s Zweig by Caitlin Hunter rocks!! Knit using Koigu. Connie finished her Zweig by Caitlin Hunter too! They are twins!! Different yarn but very similar colours! 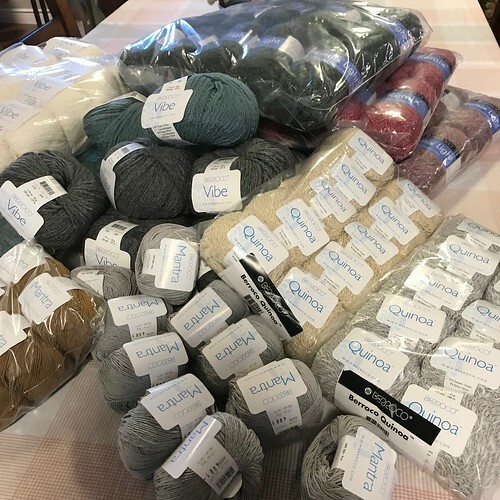 Some of the new shipment that came in from Berroco this week!! 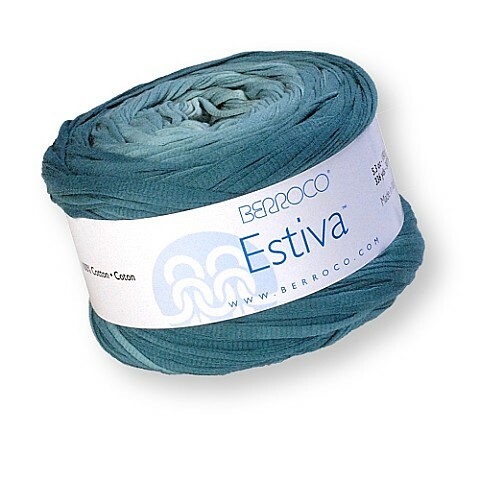 Estiva has it all! Incredible yardage—check. A tape yarn made of 100% cotton that's super soft—check. And gorgeous gradient colors that fade from dark to light? Check! Made in Italy. 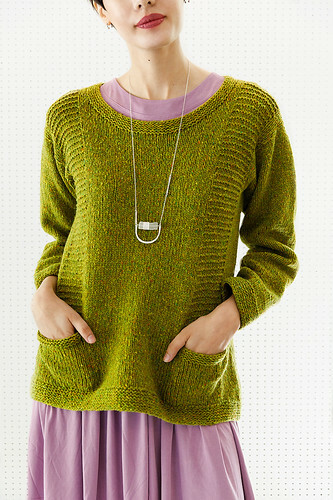 Organic cotton and organic wool come together (with just a touch of nylon) for a light, lofty yarn! 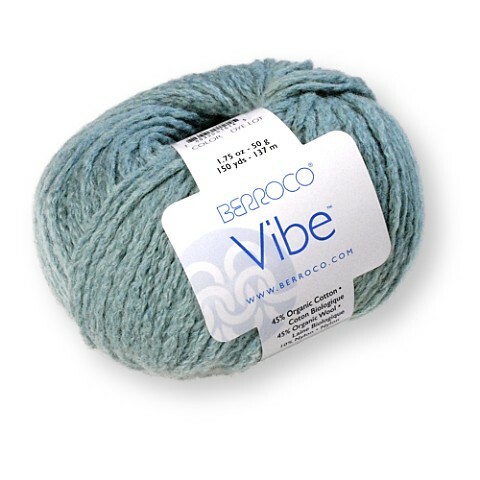 Ideal for a wide range of projects, Vibe knits or crochets quickly for cozy, all-season pieces. Made in Italy. 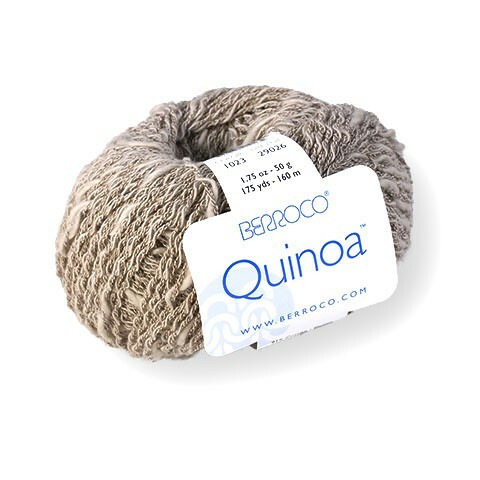 Thick-and-thin cotton is wrapped up with a nylon binder to create a slightly pebbled texture in Berroco Quinoa. Contrasting shades of cotton blended with the lighter nylon thread add a marled appearance for a unique fabric that creates lightweight knitted pullovers and accessories. Made in Italy. Pattern booklets for the above yarns can be purchased. 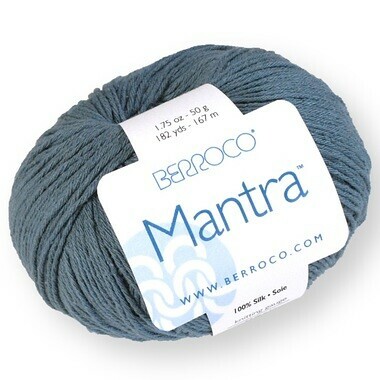 Also in, is restocking of Berroco Remix Light including two new colours, two new colours of Remix, and Millefiori Light. Interpretations Volume 6 - Joji Locatelli and Veera Valimaki; Check out their newest collaboration!